Lobe on hinge pin retainer to go in same plane as hinge lobes. 3mm wide 2 x UND only around hinge pin. I was planning to retain the hinges with AN426AD4-4 solid rivets, but the rivet squeezer does not fit inside the cove. Squashing rivets with multigrips, (as recommended by the plans), looks a bit dicey. The cove bends out of the way before 3 x BID, but this will add weight, and not allow re-installation later. Decide to use the AN426AD4-4 rivets on both sides of the middle and lower hinge, (48 required), and BSC-44 pop rivets on the top hinge, (20 required). Cut hinges for left Rudder and clamp in position on Winglet aligned with straight-edge. Install a central 3/32" cleco, check alignment and bung a second cleco in each, then a third in the bottom hinge. Hot glued aluminium spacers in hinge locations on Rudder, backed hinge positions with some scrap foam blocks and jigged rudder in position. Installed Rudder hinges with 2 x cleco for each and removed the foam. The Rudder moves! 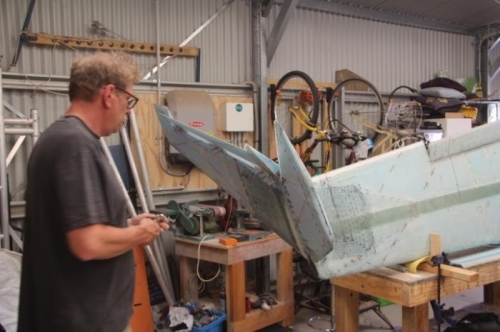 The inner skin of the bottom cut fouls the outer skin, relieved the inner Winglet skin about 0.15" to achieve clearance, The Bellhorn tip touches the outer Winglet skin at 0.1" AFTER central position, and at full deflection I get 6". Result!!! 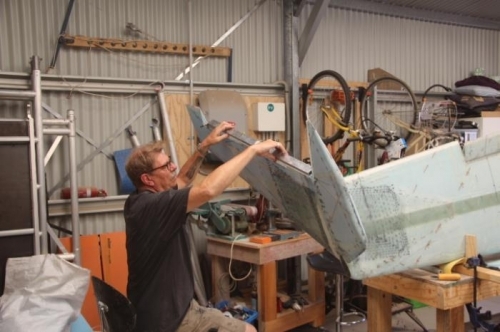 Trial install/remove Rudders. 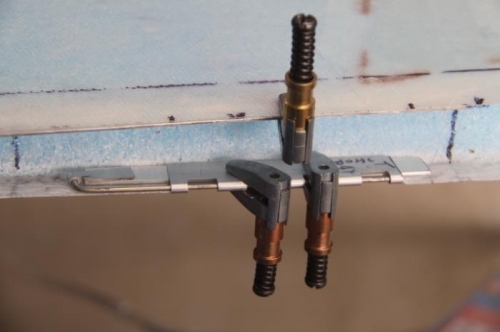 With the removable hinge pin and a pair of needle nose pliers it takes 20 seconds to remove a Rudder, and about a minute to install it. Brilliant. Hinge, Hinge pin and Retainer over spacer. Looks good! Well. That is a frikken Rudder!